We are using machine learning to calculate real-time sentiment for over 150 cryptocurrencies from millions of social media posts about them. 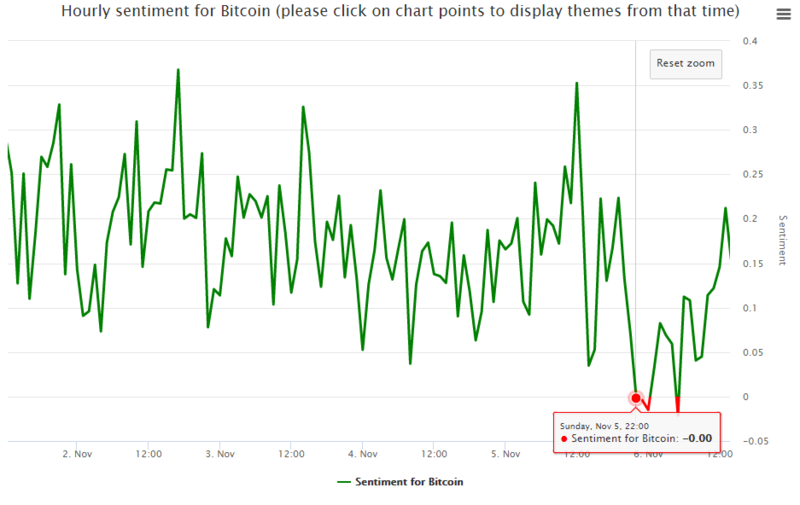 Below is the chart of hourly sentiment of Bitcoin calculated from tweets for the last week. After days of positive sentiment it suddenly turned negative on 5th November around 22 (UTC time). At that time the price of Bitcoin was around 7430 USD. If you interpreted this as a warning signal and reduced Bitcoin exposure you would have avoided the subsequent correction which went down to 7030 USD. Great BittsSignal. In the follow up post we will show you how you could use the same real-time sentiment to get back in Bitcoin and profit again, this time from rebound of Bitcoin price. If you want to be notified please subscribe or check back soon.